To get in touch with the National Regional Property team call the office on +44 (0)23 9282 3191 or email info@nationalregional.co.uk. Alternatively, fill out the contact form at the bottom of this page and we will get back to you. Our address is Victory Gate Lodge, The Hard, Portsmouth, PO1 3PU. 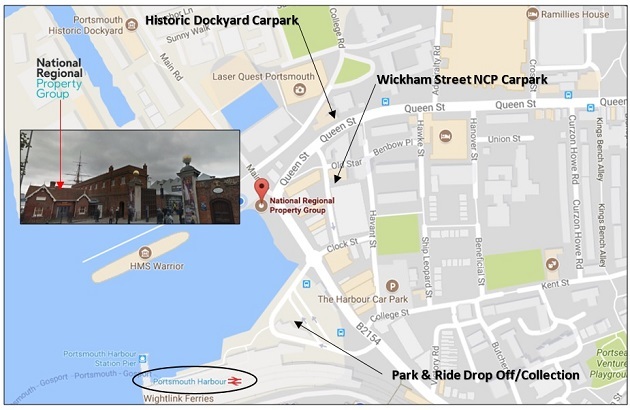 The building is situated immediately outside the entrance to the Portsmouth Historic Dockyard as shown on the map below. For full details on how to find us, including information on parking, park and ride and rail travel, download our PDF.